The ugly truth about asbestos is that many asbestos related illnesses and subsequent deaths were and will continue to be caused by another person’s failure to take reasonable care for the health and safety of others. It is therefore important to understand and to be informed of the legal avenues available should you or a loved one be affected by exposure. Compensation Claims are the most common avenue taken by those who have been affected by an exposure to asbestos fibres. Such claims are designed to compensate victims for the damages they have suffered through an exposure to asbestos, caused by the negligent actions of another person. 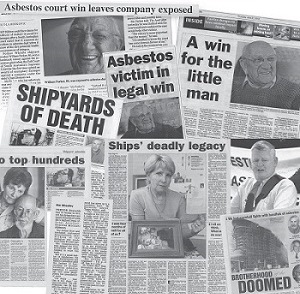 This means that it is necessary to prove that the third party responsible for exposing you to the asbestos dust and fibres (for example an employer) owed you a duty of care, was negligent in exposing you to such fibres and as a result of this negligence, you have been diagnosed with an asbestos-related disease. Compensation in asbestos related cases generally comes from the insurance company of the negligent third party responsible for the exposure. It is therefore important to provide strong evidence of both the negligence and the origins of the resulting exposure. An experienced lawyer can help you understand how liability is determined and who is liable for your suffering. Compensation in the form of damages is generally limited to compensate for losses actually suffered. Therefore, it is important to receive the advice of an experienced lawyer to ensure that your compensation claim adequately reflects the losses you have suffered as a result of an asbestos related disease. In some rare cases, the courts will award punitive damages, this will be a larger additional amount intended to also punish the negligent party. Sadly, evidences of the health dangers associated with asbestos were ignored by many manufacturers and employers, leaving employees and consumers exposed to the deadly fibres. Therefore, in cases where the victim of the asbestos-related illness has died, they recognize the importance of ensuring that dependents of the victims are adequately compensated for their loss of financial support.